In compiling this list of the ten key conservatory points to consider when building a conservatory we have attempted to ensure that if you follow this guide you will have a better chance of the resulting conservatory or orangery meeting your needs. Some of the points raised depend on subjective interpretation and individual circumstances can differ widely. Just a Quote offers this as a checklist and we feel that each point should be properly considered before the specification of your proposed conservatory is finalised. Conservatories don’t need to be enormous but more importantly, they shouldn’t be too small either – they should be just big enough for the purpose intended whilst being in proportion with the rest of the property. Subject to the specification and degree of difficulty in construction, smaller conservatories are naturally less expensive but one twice the size should not be twice the cost. We suggest that you mark out the size and shape of the conservatory on the ground, allowing for the fact that a cavity wall is normally 250 mm to 275 mm thick. The external size is important in terms of the conservatory fitting it into a particular space, but the internal size is also important for the furniture you intend to place inside. It’s a good idea to mark out the footprint of the conservatory with bamboo canes for example and even position furniture on your lawn, ‘inside it’. You can experiment with the size as much as you like prior to building your conservatory, but it’s too late afterwards. One idea to consider where space is a premium, is to use full glass or PVCu panels down to the floor instead of building a dwarf wall. You will still have privacy at a low level with the PVCu panels but without the loss of space taken up by the width of a cavity wall. 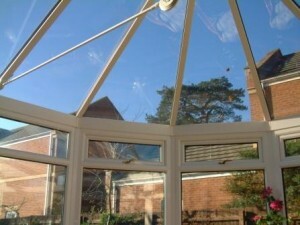 This P shaped Gable conservatory is fine on a large detached house but wouldn’t fit or look right on a smaller property. 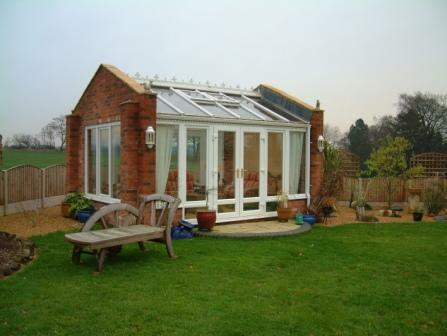 Equally, a small sun lounge or lean-to conservatory would look out of place on a large property such as this. 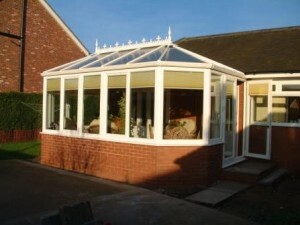 The shape, or style of your proposed conservatory needs to be considered along with its size. A small Victorian conservatory with the loss of space caused by a curved front may not be practical whilst a Sun-Lounge, Edwardian or Gable design with the same width and projection may well be, due to the fact that it is square or rectangular. Another consideration is that the shape often determines the roof style. Because of its footprint, a Victorian conservatory with a pitched roof must have a high central ridge with the roof panels sloping down towards the eaves. Often, architects and designers will suggest that the style of a conservatory should follow the style of the host property. In fact when applying for planning permission for a traditional brick and tiled roof extension, that would normally be something that your local planning authority would take into account. Some designers would suggest that a house with a hipped roof should have a hipped roof conservatory (Edwardian design) and one with gable ends should have a Gable style conservatory. Although we have some sympathy with that view but we don’t believe that the rules should be applied quite so rigidly. In order to ensure that the size of your proposed conservatory is in proportion with your home, the shape can become paramount. A small conservatory on a large house rarely works, and the reverse is also true. 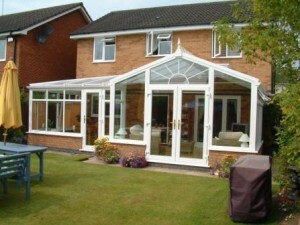 For a very large property, P Shape and T Shape combination style conservatories can be considered. These are combinations of the basic designs linked together, such as an Edwardian conservatory with a Sun-Lounge on either side to form a T Shape. Further, on large and grand properties, a conservatory with a lantern roof may seem appropriate, whereas it would look over the top on a small terraced or semi-detached property. Not many homeowners have much of a choice of where to position a conservatory on their home – it is usually built off the rear lounge or dining room. And only the largest of properties and the wealthiest of owners can afford the luxury of having more than one conservatory built. The position or aspect, of your conservatory is a central factor in its design and specification. A south facing conservatory will receive much more sun (and solar heat gain) than a north facing one and consideration needs to be taken to make the conservatory work for you and be fit for purpose. The aspect of your conservatory should dictate the type and quality of ventilation, shading and insulation and it will certainly affect the type of roof glazing to be installed. 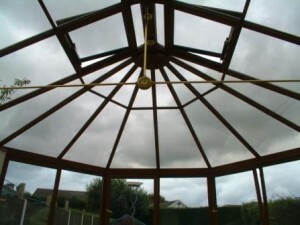 Glass or polycarbonate in your conservatory roof? Should you install glass or polycarbonate in the conservatory roof? This will be one of the most important choices you make when specifying your conservatory. Polycarbonate was developed as a conservatory roofing material as a lightweight and inexpensive alternative to glass. Because of this, it is currently installed in more conservatories in the UK than glass is. Polycarbonate is available in many thicknesses and colours to suit the host conservatory – including versions which reduces solar heat gain. Glass for conservatory roofs, in its basic form, as ordinary clear glass is rarely suitable for conservatories due to the enormous solar heat gain through it. This is because the sun will be directly above your conservatory in mid-summer, even if it is north facing. However, glass for conservatory roofs is now available as tinted, self-cleaning and resistant to solar heat gain – and at all times should be safety glass. One other advantage that a glass roof has over a polycarbonate roof, is that it is much quieter when it rains – but more importantly than that – you can see the sky through it. The aspect of a conservatory should dictate its specification with regard to insulation and ventilation. Also, a glass roof such as this one adds a touch of class to a conservatory but if it is south or west facing, it should control the amount of solar heat gain otherwise roof blinds will almost certainly be required. 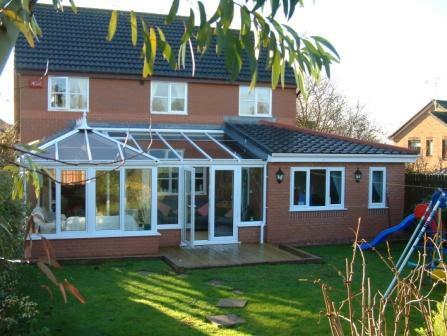 All rooms in the home require heating and that is no different with conservatories – just more so. Most rooms however, can manage, in this country at least, without cooling, but it can be an important requirement in some conservatories, especially those which are south facing. Here, we consider the different forms of heating, including underfloor heating, natural ventilation & air conditioning, the use of tilt & turn windows, conservatory window & roof blinds and the problem of condensation. There is a wide range of heating choices available to the new conservatory owner but to satisfy Building Regulations the system must have its own separate control system to the rest of the house. If your existing central heating boiler can cope with additional radiator(s) for another room, the simple answer is to extend the central heating system into your conservatory – though it must be fitted with a thermostatically controlled valve. A variety of other heating systems are also available, including fan heaters, oil filled radiators, storage heaters and under floor heating. Under floor heating was employed by the Greeks and Romans in around 500 BC but can actually be traced back to 5,000 BC from archaeological digs in the Middle East. Modern under floor heating systems can use either hydronic or electrical systems. Hydronic systems use water, sometimes with anti-freeze added, which is re-circulated within pipes generally made from polyethylene. The fluid is heated by a boiler and pumped around a system of pipework underneath the floor and requires installers with skills similar to central heating installers. 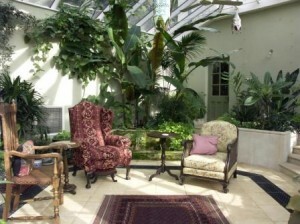 The addition of a chiller unit means that some hydronic systems can also be used to cool the conservatory. Electrical systems are used for heating only and use flexible heating elements often embedded in pre-formed mats which are normally much thinner than the pipework in hydronic systems and easier to install. As for cooling a conservatory, there is no substitute for designed-in natural ventilation – this can consist of simply windows which open, or a proprietary eaves and ridge ventilation system. Some designers and installation companies will limit the number of opening windows in their proposed specification simply to keep their quotation low and improve their chances of winning your business – this is false economy in the extreme. And although air conditioning may be appropriate for some conservatories, it should never have to be installed purely to compensate for the lack of natural ventilation which should have been included in the original specification. Tilt and turn windows should be strongly considered due to their large size and method of operation. When tilted inwards, any breeze from outside the conservatory will be directed towards the hottest area of the conservatory (the roof space). Alternatively, when a tilt and turn window is swung open into the conservatory, it provides almost as much ventilation as a door. The British Board of Agrément (the body which assesses and registers building products) recommends that the minimum area of opening windows and doors to provide ventilation in a conservatory should be 15% of the floor area. This compares with a Building Regulations rule for other rooms in the house of 5%. Another advantage of tilt and turn windows is that no horizontal transom bar is required as with outward opening casement windows. Horizontal transom bars in conservatory windows tend to be in the line of sight when you are standing, potentially spoiling the view of your garden. Another popular method of cooling a conservatory or orangery – at the same time as providing a degree of privacy – is by installing window or roof blinds. A wide choice of blinds is available but pleated, roller and Venetian blinds are probably the most popular for conservatories. Blinds can also be installed in the roof but for conservatory roofs with triangular panels, roof blinds can be quite expensive, so the cost should be factored in at the time of budgeting for your conservatory – it may convince you to choose solar control glazing instead, or perhaps a different style of conservatory and roof. Condensation can be one of a conservatory’s worst enemies due to the large expanse of glass in the structure. Energy efficient windows and doors, loft insulation and fitted carpets have all contributed to making homes less draughty by virtually eliminating natural ventilation. They can however, result in an increase in condensation due to this lack of natural ventilation. Water vapour is produced naturally as a bi-product of normal day-to-day living such as washing, cooking and simply breathing and the warmer the air the more water vapour it can hold. When air can hold no more water vapour it is said to be saturated and when saturated air comes into contact with a surface cooler than itself – such as the glass in your conservatory – the air cools and therefore cannot hold as much water vapour. The excess water vapour is deposited onto the glass, firstly as mist then in larger amounts as water droplets. The greater the temperature difference between the air and the glass, the more condensation there will be. Because argon is denser than air, argon-filled insulating glass sealed units will keep the inner sheet of glass warmer than air-filled sealed units would and therefore help to reduce condensation. The situation with day-to-day condensation should not be confused with the initial condensation which appears just after a conservatory is built. Many gallons of water are used in the conservatory base, floor and dwarf walls during construction and these have to be allowed to dry out. Opening windows and doors during dry, breezy days will generally work better than just heating. Heating the conservatory will allow the air inside to hold more water vapour so the condensation will simply evaporate and condense again later once the conservatory cools down. Opening windows and doors allows the saturated air to escape and be replaced with drier air. De-humidifiers are also sometimes used to extract water vapour from the air but drying out too quickly may cause cracking on a screeded floor or plastered wall surface. 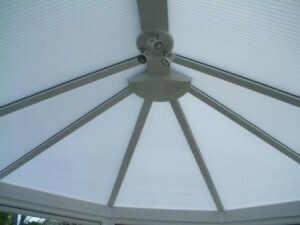 Pleated fabric blinds in a white PVCu ‘P-Shape’ conservatory which can help keep conservatories cooler in hot weather. Only rarely does a customer complain that there are too many electrical sockets in a room but there can often be too few. Installing extra sockets some months after the original build can be expensive and disruptive to the décor in your conservatory. You may choose to have a socket in a particular corner because you intend to position a television there or that’s where you want your favourite chair if you enjoy reading. However, consideration should also be given to the fact that you may move the furniture around from time to time and the need for electrical sockets in different positions may change. As for lighting a conservatory is unlike any other room in your home, so due consideration needs to be given not only to creating the atmosphere you want to achieve but also to do it without either creating dark corners or making your conservatory a beacon for your neighbours. A combination of different types and styles of lighting generally work best in a conservatory and there will rarely be simply one central ceiling (or roof) light as in some other rooms in your home. You should consider wall lights, down lighters possibly in the ridge (or around the perimeter of the roof in the case of Orangeries) and lamps positioned on the floor or internal window board of your conservatory – some of which can be controlled by dimmer switches. The type of flooring you choose for your conservatory will, in part at least, be determined by its intended use as they all have various advantages and disadvantages. The vast majority of conservatory bases will be constructed with concrete floors which, without under floor heating can be cold during the winter. Carpets or ceramic tiles in your conservatory? Although some people may carpet their conservatory, a mat or rug would be essential by the entrance / exit door to avoid dirt and mud spoiling the floor covering. Because of this, ceramic, slate or stone floor tiles and vinyl are popular easily cleaned alternatives and there is an extremely wide choice of all of them. Once laying costs are taken into account, floor tiles would generally be the more expensive choice but would last much longer than any soft floor coverings. On large conservatories which are effectively used as more than one room, each area could be treated differently, with for example, carpets in the lounge area and ceramic or stone floor tiles in a dining area. The rules relating to planning permission and building regulations are dealt with in detail in another part of this website. The two sets of rules are often confused with each other but generally speaking, planning permission grants the right to build a conservatory whilst building regulations deal with how it should be properly constructed. For most conservatories neither planning permission nor building regulation approval is required but since the rules are independently applied, either one could be required without the other. As regards planning permission, building a conservatory or orangery on your home is considered by the local authorities to be permitted development, which means that it does not need an application for planning permission as long as certain conditions are met. The planning rules clearly state what is not considered permitted development’and therefore when planning permission is required. What is not so commonly known is that local authorities can withdraw permitted development rights, and quite often do for an entire new development or estate of properties, so it is always the advisable to check with your local planning authority. The reasoning behind this is that many new developments have a high density of housing and the local authority want to keep an eye on all extensions to properties. If permitted development rights have been withdrawn in respect of your property, then a planning application will be required regardless of the size, design and specification of your proposed conservatory. The only advantage is that any planning application fees are normally waived. Another consideration to be aware of when planning a conservatory, particularly if your property is relatively new, is that of builder’s consent, i.e. the original builder of the property. Often when a new development or estate of houses is constructed, covenants are placed on the deeds of properties which restrict the types of things which can be done in the vicinity. Sometimes developers will restrict the parking of caravans, boats and commercial vehicles on driveways but more importantly they may include a requirement for builder’s consent to be granted for any extensions or alterations to the properties. Usually these covenants only last for five years but it is certainly worth checking to avoid potential problems at a later date. The builder will typically request a drawing and specification of the proposed conservatory together with an administration fee but the applications are rarely refused due to the threat of a potentially expensive legal challenge. 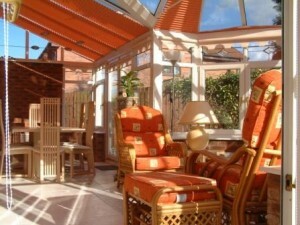 Most people will spend more time in their gardens after having a conservatory built than they did beforehand. You will certainly spend more time looking at it – from within, so there is no better time to consider a garden makeover than when building your conservatory. It makes even more sense if you are considering any hard landscaping such as patio areas, garden walls and steps as these can be constructed at the same time as the conservatory base and walls, often by the same builder, with matching materials. Different types of paving to be considered include pattern imprinted concrete, block paving and resin and aggregate surfaces. Planning your garden is just as important as planning your conservatory and consideration should not only be given to style and specification but also to your budget. Some soft landscaping such as shrubs and plants may have to wait, as may garden furniture, but these are both things which can be added easily at a later date when your budget permits. There are several aspects to consider which fall under the insurance banner. Firstly, if your property is a relatively new one it may still be covered by the NHBC Buildmark Ten Year Guarantee and adding a conservatory could well affect this guarantee. Once your conservatory has been constructed it will have enhanced the value of your property and you really should inform your buildings and contents insurers. Any increase in the annual policy fee should be minimal but failure to inform your insurer could be the minor reason they need to invalidate any future claim. Certain products and conservatory specifications recommended by your chosen installer may seem unnecessary optional extras which appear to offer no real benefit, just cost. A competent builder, operating to best building practice may suggest certain products which others have avoided purely to keep their quotation relatively low – and so be in with a better chance of winning your business. This can be a short term view but if one particular product falls into this category it must be a cavity tray. If the host wall for your conservatory is exposed to more than average rainfall then the outer skin of brickwork above the conservatory roof will (being porous) permit water to penetrate through to the cavity. A cavity tray collects this moisture and returns it back to the outside – the shape and size of your conservatory roof will dictate the specification of the cavity tray. Failure to do this can eventually lead to a damp house wall inside the conservatory as water trickles down inside the cavity and penetrates back to the outside or the brickwork. This can be a particular problem if that wall has been plastered; a cavity tray offers insurance against such problems. 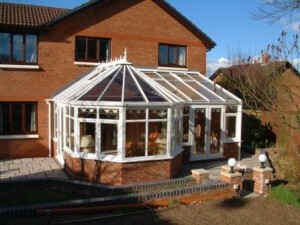 Most builders and installers offer credible guarantees which cover the conservatory in terms of both product and labour. FENSA (which covers the installation of replacement windows and doors and requires all registered members to provide an insurance backed warranty and deposit indemnity warranty) does not apply to conservatories. Your installer however, should provide an insurance backed warranty and deposit indemnity warranty, both of which protect you in the event of the installation company’s failure, either during the build or during the term of their warranty period. Finally, ask to see the public liability and employer’s liability insurance certificate of your chosen installer to ensure that you are covered in the event of a problem. You may think that the cost of your proposed conservatory should have appeared a little higher up this list than at number 10 in a list of 10 things to consider when building a conservatory. It is our contention however, that unless most of the matters covered in 1 to 9 above are satisfied, then cost is irrelevant. The capital cost of the project is the one that generally features most prominently when considering the size, style, specification and who is to build it. But finishing touches such as heating, cooling, lighting, furniture and a garden makeover should also be considered in the budget. The conservatory’s running costs should also be taken into account as there is no point skimping on insulation and energy efficient glazing in a north facing conservatory only to spend a fortune heating it over the years in order for it to be usable. Likewise, if you are considering moving house within a couple of years but want a conservatory in the meantime or to help sell the property, don’t spend a fortune on over-specifying it – you will not get the benefit, nor will you recover the cost. If you are looking to finance your new conservatory with a loan, either by extending your mortgage or borrowing from a bank – consider all of the associated costs, not just the interest rate and if in doubt take independent advice. ‘Just a Quote’ cannot and does not offer financial advice but don’t be surprised if the cheapest loan quotation is from the installation company itself – if it offers finance. Installation companies which offer finance to support the sale of their products tend to have a range of financial products just like banks. You do not have to accept deals with high interest rates as they may be holding their best rate back – along with interest free and ‘buy now pay later’ deals – though these may carry a subsidy which a cash buyer wouldn’t suffer. Finally, when buying a conservatory in your home, do get a number of comparable quotes from different companies, do not buy on the salesman’s first visit (he WILL return if he values your business), do not accept the first price he offers (be prepared to negotiate) and make sure everything is in writing. There are many aspects to the specification of a new conservatory which can affect its price but one of the most obvious in terms of appearance is the choice between a polycarbonate or glass roof. In our opinion a conservatory with a glass roof is far superior, but more expensive than one with a polycarbonate roof, though you must include in the specification measures to control solar heat gain within the conservatory.